Though his are the most famous, King Ludwig was not the only king who built palaces in Bavaria, Germany. 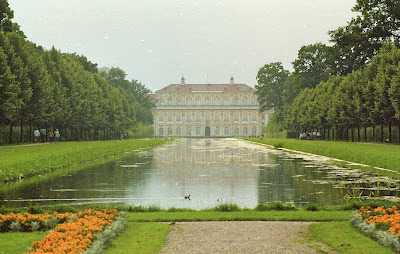 With a home base in Munich you can visit any number of interesting palaces and beautiful gardens. One of those is Oberschliessheim Palace in the village of Oberschliessheim very near Munich, which was built as a summer residence for Bavarian rulers. The grounds are actually home to three palaces: Old Schliessheim Palace, Lustheim Palace, and New Schliessheim Palace. The old palace is what was built as a country house by William V in 1598. It was heavily destroyed in World War II but has been reconstructed and is available to tour. Lustheim Palace is more of an Italian villa style building built in 1684 for Maximilian II Emanuel and his wife, the Austrian princess Maria Antonia. 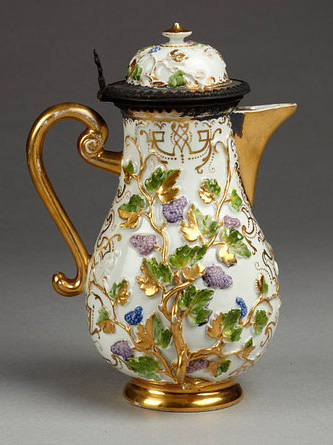 This residence houses the second largest collection of Meissen porcelain in Germany, and although this tour wouldn't interest young children, I have been intrigued by it both as a teenager and as an adult. 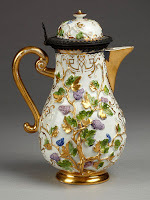 Meissen tableware and gallant figurines influenced porcelain making in all of Europe in the 18th century. The New Schliessheim Palace was constructed in 1701 - 1704, and was enlarged two decades later. The interior of the palace is a baroque masterpiece, especially the impressive Grand Hall, Grand Gallery, and main staircase. Several rooms in the palace now exhibit famous baroque paintings by Peter Paul Rubens, Anthony Van Dyck, and other Italian, German, and Spanish artists. As always, I love the palace garden. Oberschliessheim's gorgeous garden is one of the rare preserved baroque gardens in Germany and is still largely in its original form. There are canals and other water features. Oberschliessheim Palace is closed on Mondays, but otherwise open from 9 am to 6 pm from April to September and 10 am to 4 pm from October to March. No guided tours are offered but audio guides are available for rent. Admission is 4.50€ for adults and free for children under 18. How wonderful! It's funny and so irritating too, when so many places are closed on Mondays, but I guess it makes sense, they are open to the public all weekend long, and they do need a day off. I have found also that many people stay home on Mondays so even restaurants are the best on a Monday, if they are open!